Irka Caciedo and Dawn DeWilde won both their rubbers for Canoe Lake, writes Alan Best. But they dropped a set to Anna Newman and Natalie Denby, which was enough to enable the Havant-based team to claim winning draw points. A number of the ladies matches were rained off, but Ryde Mead beat the weather to complete a 4-0 win over Avenue thirds. Lee's fourth team, who played on Sunday, overcame Warsash thirds by a 3-1 scoreline, taking them to the top of division five. Avenue seconds recorded their second successive win in men’s division two. 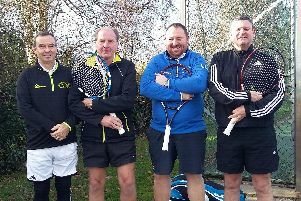 A match tie-break win for George Bentley and Ross McPherson against Josh Pitak and Simon Boswell proved to be crucial. Seacourt followed up last week’s win with another impressive 4-0 victory – this time against Southsea seconds. One division down, Avenue thirds were forced to settle for a 2-2 shared rubber against Fishbourne seconds. It was Fishbourne who collected the winning draw point, taking five sets to Avenue's four. There was a similar result in men's division five, with Canoe Lake the victors in this case. Lake’s Tim Fielder and Martin Jewell claimed a set in the rubber they lost to Chris and Carl Titterington. That proved enough to give Lake the 5-5 set advantage. Seacourt seconds were the other winners in this division. They defeated Ryde Mead's second string 3-1. Jack Dodgson and Aaron Flippence won both their rubbers. 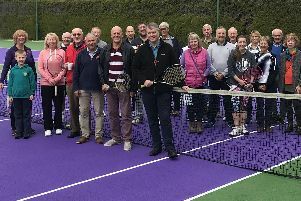 Ryde Lawn mixed thirds continued their unbeaten run in division two, although they needed two match tie-break wins to overcome a determined Chichester team. Jon Brown and Suree Russell squeezed past Rory Cavanagh and Suzanna Troy in a tie-break to level the first round of rubbers at 1-1. Lynn Sandy and Karl Bateman teamed up, coming back from a set down against Cavanagh and Troy to steal the tie-break and with it the match. In the same division, Warsash thirds made the long trip to Ventnor but came back with only one point to show for their efforts. Youngster Elliot Jones was the star of the show, winning both rubbers. In mixed division three, Carlton Green and Fishbourne seconds scored comfortable victories over Rowlands Castle and Southsea respectively. Meanwhile, Alverstoke maintained their impressive start to the season with a 3-1 win over Warsash thirds. Ryde Lawn were in midweek action, continuing their resurgence from an early season defeat as they saw off the summer league champions Chichester 3-1. The islanders men proved too strong. David Lloyd West End kept up the pressure at the top of the table. They followed up their early season win over Ryde by beating their second team. It proved to be a close contest in which the rubbers were shared and the teams were only separated on a countback of sets, 5-4. Rowlands Castle kick-started their midweek mixed season with an impressive 3-1 victory over Fishbourne seconds. Lee recorded a win by the same score against Carlton Green. Three of the four rubbers went to match tie-breaks, with Lee winning both the ladies doubles rubber and the men’s one on tie-breaks. And in the ladies midweek leagues, Chichester beat Warsash by 3-1 while Ryde Lawn eased past Canoe Lake by the same score. The league now looks like it will be an interesting tussle between the two winning teams and newcomers Avenue.